Gynecomastia (male breast enlargement) is a condition no man desires not only is it unpleasant at best even the idea of it is horrifying. While Gynecomastia is by no means life-threatening it can be severely damaging to one’s personal state of mind, as it can cause the best looking physique in the world to look like a giant heap of garbage. There are many forms in-which Gynecomastia can take and many starting points that led to the condition. However, some are simply due to age and hormonal imbalances and many cases are due to anabolic androgenic steroid use, again, causing a hormonal imbalance. 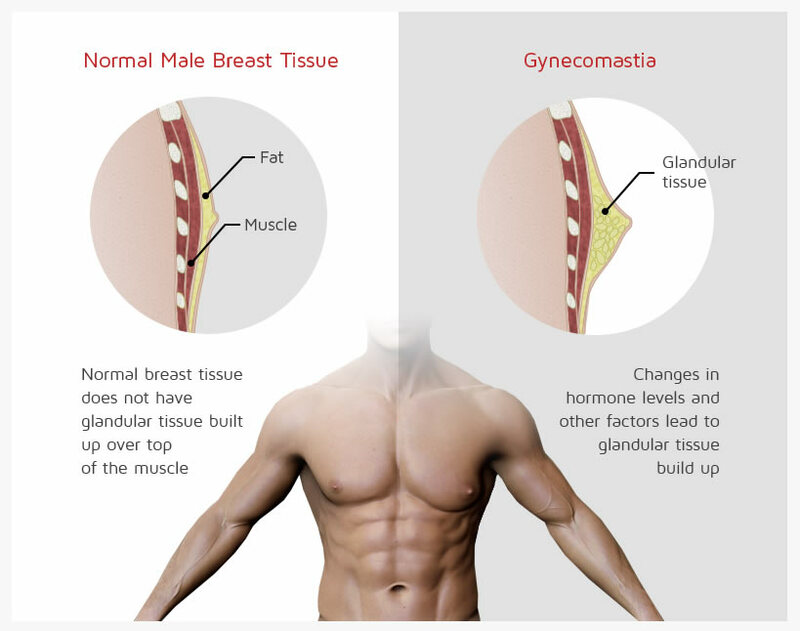 Gynecomastia is simply a condition in-which the chest of a man begins to take female shape as is evident by the name itself as Gynecomastia means “woman breast.” In most cases a hormonal imbalance causes the problem and estrogen build-up is almost always the culprit but progesterone can also play a key role. As it pertains to glandular Gynecomastia there are three common groups of people and surprisingly to many a large portion is comprised of young adolescent boys. Often this is caused by excess hormones being passed on from the mother at birth but fortunately for the majority of young men as they reach adult hood it will normally dissipate however, approximately 30% of all pubescent Gynecomastia cases will require surgery to remedy. Those who are of an elderly nature may find a similar situation as the young adolescent as age creeps on hormonal imbalances can occur and because the skin is often softer at an older age it can look pretty nasty. In most cases those who are elderly will only find surgical remedy to be their saving grace however, hormone replacement therapy does provide a chance of remedy but it is by no means a guarantee. Many athletes who use anabolic steroids stave off the effects of Gynecomastia and quite frankly there are really very few people who should ever fall prey if they are responsible and take precaution however, some will be so sensitive to steroid use that all the precaution in the world will do them no good at all. By-in-large Selective Estrogen Receptor Modulators (SERM’s) are the most common means of prevention including aromatase inhibitors and estrogen receptor antagonists. Even so, as was discussed, some are so sensitive all the aromatase inhibitors in the world won’t do a thing. For this individual surgery will be the only option and the glands in the chest must be removed normally the process is very quick and an outpatient procedure. In most cases a small incision will be made in the areola and will generally leave no scaring. Liposuction may be part of the process too as excess adipose tissue may be part of the problem as we discussed above.